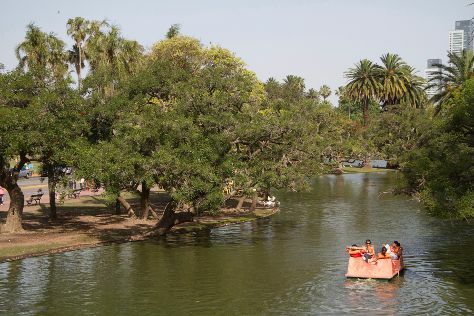 Get in touch with nature at Parque 3 de Febrero and Paseo de la Costa. Head to Puerto Madero and Puerto de Frutosfor plenty of shopping. Explore the numerous day-trip ideas around Buenos Aires: La Plata (Planetario Ciudad de La Plata, Curutchet House, & more), Barco Bruma (in San Fernando) and Tigre (Museo de arte Tigre & Trilenium Casino). There's lots more to do: admire the masterpieces at Museum of Latin American Art of Buenos Aires, don't miss a visit to Recoleta Cemetery, get to know the fascinating history of La Boca, and wander the streets of San Telmo. If you are flying in from South Africa, the closest major airports are Jorge Newbery Airpark and Ministro Pistarini International Airport. January in Buenos Aires sees daily highs of 33°C and lows of 24°C at night. Finish your sightseeing early on the 28th (Wed) so you can travel back home.